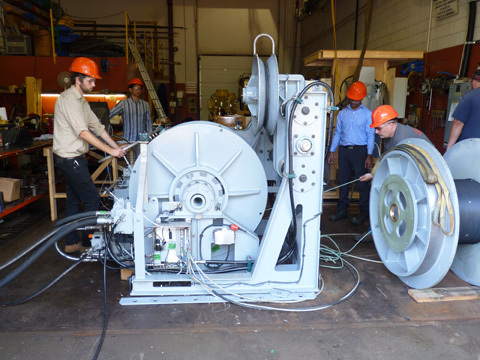 Marine Superintendent John Bichy recently attended a Factory Acceptance Test (FAT) for the R/V Savannah’s new trawl winch. A proposal to the National Science Foundation was funded to replace the trawl winch on the R/V Savannah. This new winch was designed to meet new requirements set forth by the UNOLS Research Vessel Safety Standards. Skidaway Institute selected HAWBOLDT Industries to design and build the winch. By the end of August 2016 the production phase was complete and the winch was ready for testing. The FAT was conducted September 7-9 in Nova Scotia. A multitude of tests were performed on the winch, including pull, speed, brake, load and control tests of various types. The new winch will be installed during the winter dry dock period in February and March 2017. When the install is complete the R/V Savannah will have one of the most sophisticated winches in the UNOLS fleet.